Last month we gave you an insight into MCG Legal’s Principal and founder Matt Gill. This month we’re throwing the spotlight on Nick Harrison! Nick arrived at MCG Legal with a unique blend of theoretical and ‘real life’ experience. Before becoming a lawyer, Nick served the community for approximately 12 years as a Queensland Police Officer. It was off this base that Nick launched the rest of his life. Nick developed his ability to communicate with people in difficult situations during his time as a police officer and has found that it is a characteristic that is highly valuable as a lawyer. During his time with the Queensland Police Service, Nick completed a Bachelor of Business in Management and upon leaving the Queensland Police put that knowledge to good use as a successful entrepreneur in the Hospitality Industry. However, the arduous shift work in hotels and pubs kept him away from his family, so at age 36, Nick went back to university to study a Juris Doctor. Going back to university was a massive personal sacrifice for Nick, and he found it challenging at times. Being a mature age student, Nick was juggling a very different life to most of the cohort. He accelerated his degree to try and get back into the workforce as soon as possible, and in 2011, Nick graduated with Honours from Bond University. He has a particular interest in family law and issues involving domestic violence. Due to his experience with the Queensland Police, Nick also regularly represents clients on criminal and traffic matters. He believes that dealing with emotion and conflict – something he had to do regularly with the police force – gave him a good introduction to the type of work he does now as a lawyer. According to Nick, the most competent and effective police officers have great communication and interpersonal skills. It is much better to be able to talk your way out of a scenario than find yourself wrestling with someone trying to arrest them, and for Nick, it’s these skills that most easily translate to law. He prides himself on collaborating with clients to identify their priorities and providing them with accurate legal advice which produces commercially sustainable outcomes. Outside of work, Nick is heavily involved in local community activities through a lifetime association with the Broadbeach Sports Club. Nick is the President of Broadbeach Cats and has volunteered considerable time and energy to its ongoing success. Nick also enjoys playing golf and has a passion for surfing. Part of managing the stress of being a lawyer is by having active and rewarding social interests. “Cathartic” is a word Nick used when describing his sporting activities, especially surfing. 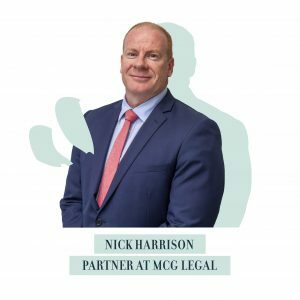 If you want to get in touch with Nick, or any of the MCG Legal team, please give him a call at (07) 5591 2222 or contact us.